You don’t have to break the bank upgrading your vehicle’s factory stereo just to listen to your iPod’s or MP3 player’s music. There are plenty of methods to connect your iPod to your car’s stereo system, all differing depending on your vehicle’s make and model. This article will cover the most popular methods to connect your device to your car’s stereo system. Note: If your vehicle is newer, it may already come equipped with a 3.5 millimeter auxiliary input jack. This auxiliary jack, often labeled as a headphone jack, will most likely be located on your car’s stereo panel. Step 1: Install the auxiliary connection. Plug one of the auxiliary cable end into your car’s auxiliary input jack and the other into your iPod or mp3 player’s headphone jack. It’s as simple as that! Tip: Turn your device to full volume, as you can then use your radio panel’s volume control to adjust the volume. If your vehicle is newer, it may be equipped with Bluetooth audio streaming capabilities. This allows you to connect your iPod without the worry and hassle of wiring. 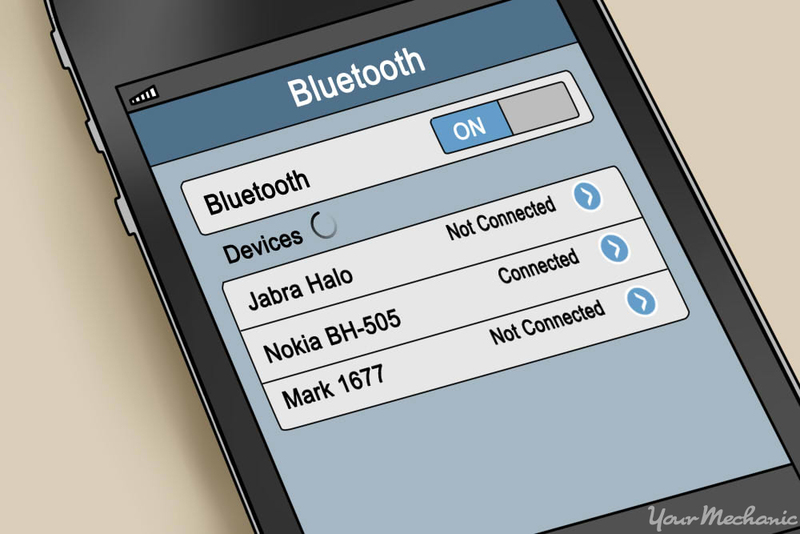 Step 1: Turn on your bluetooth device. If you turn your iPod’s or iPhone’s bluetooth capabilities on, you will be able to pair your device with your vehicle’s factory radio. Step 2: Allow device to connect. Simply follow your iPod’s or iPhone’s prompts to connect via Bluetooth to link the two systems. Step 3: Control the device. Once connected, you will be able to use your car’s factory radio controls and steering wheel audio system controls to adjust and control your iPod or iPhone. Note: You may have the option to use additional applications - such as Pandora, Spotify, or iHeartRadio - to play music through your car’s factory radio. If your car is newer, it may also be equipped with a USB input jack in your car’s factory radio system. If this is the case, you can simply plug in your iPod or iPhone’s charger or lightning cable into your car’s factory radio USB input. Step 1: Connect USB cable. 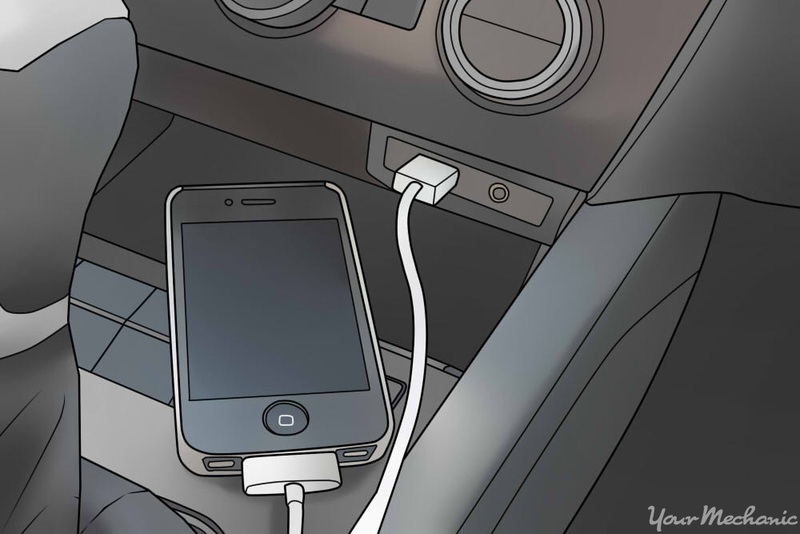 Use a USB charging cord (or lightning cable, for newer iPhones) to connect your smartphone to your car’s factory USB input. In most cases, this method will allow information from your device to be displayed on your car’s factory radio display. You may even be able to charge your device directly through the USB input. Note: Again, be sure to bring your device to full volume, allowing maximum control through the vehicle’s interface. If you have a vehicle equipped with a cassette player, you might feel that your stereo system is out of date. 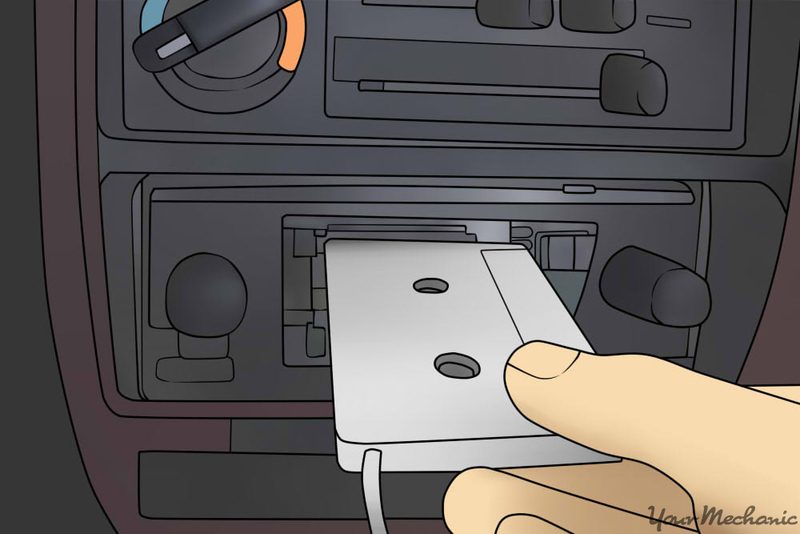 An easy fix is to simply purchase a cassette player adapter, allowing you to make the connection with your iPod. Step 1: Insert adapter into cassette slot. Place the adapter into the cassette player as you would with an actual cassette. Step 2: Plug cable into iPod. Now, simply plug the accompanying auxiliary cable into your iPod or iPhone. 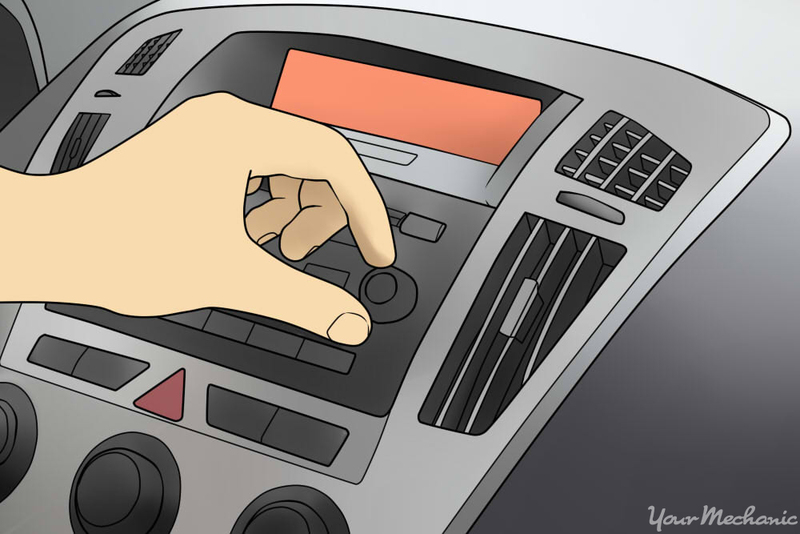 Note: This method also allows control through the radio panel, so be sure to turn your device to full volume. If you want information from your iPod or iPhone to be displayed directly onto your vehicle’s radio display - and if your vehicle is equipped with either a CD changer input or satellite radio antenna input, you should consider this option. Step 1: Refer to your car manual. Refer to your car manual before shopping to ensure you purchase the right type of adapter. The type of stereo iPod adapter you get will depend on your car’s make and model, and it’s best to consult your manual to make the best choice. Step 2: Replace factory radio with iPod adapter. Remove your vehicle’s factory radio and install an iPod adapter in its place. Step 3: Adjust the settings on your radio panel. You should be able to modify the volume of your iPod’s music by adjusting the settings on your radio panel. As an added benefit, in most cases you can even charge your iPod or iPhone using these adapters. Note: These type of adapters require either a CD changer input or a satellite radio antenna input. 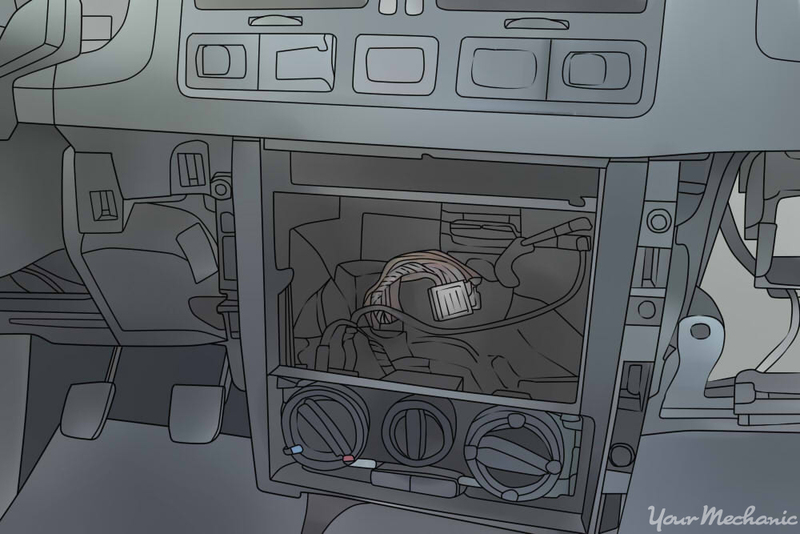 Warning: Remember to disconnect your car’s battery when uninstalling or installing the adapters to your car’s factory radio to ensure everyone’s safety. Working with connecting and plugging in cables while your car battery is running puts you at risk for electric shocks and electrical shorts. If your car is equipped with a rear cabin DVD entertainment system connected to the factory radio, you can buy an A/V cable set to connect your iPod to the car’s stereo, allowing you to make use of existing hardware in your car. 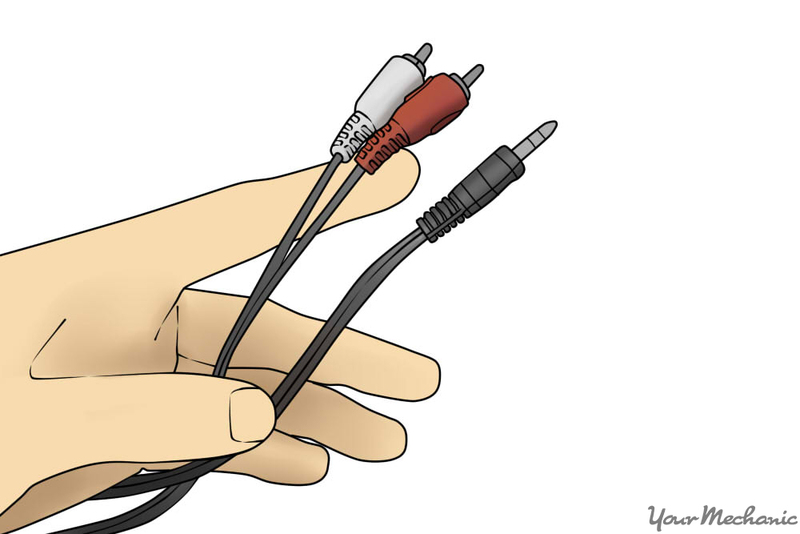 Step 1: Install A/V Connection. Plug the two audio cables into the rear DVD entertainment system’s A/V input jacks. Note: Refer to your vehicle’s manual to locate these inputs, as they vary between makes and models. Tip: Again, turn up the volume on device to fully interact with car radio interface. If your car is not equipped with the correct systems to perform any of the methods above, you may purchase an FM adapter. Older cars, for example, may not exactly have the capacity for the above functionalities, which makes the FM adapter the best option. Step 1: Connect your device. Plug the adapter into car and the cable into your device. Step 2: Tune into FM radio. Using your mp3 player, smartphone, or other device, tune into FM radio. This will allow you to tune your factory radio to the correct radio station - as indicated by your FM Adapter’s specific instructions - to hear your own songs and audio via this FM radio connection. Tip: While this solution will play your device’s music through your FM radio system in your car, the connection is not ideal, and this method should be used as a last resort. These methods will allow you to access the music on your iPod or iPhone when you are driving, giving you maximum control over the songs you hear without commercials or inconvenience for an overall better driving experience. If you find that your stereo isn’t working optimally because your battery is on its way out, have one of our certified mechanics come to your work or home and replace it for you. Q: Why my infotainment automatically turns off every 10 minutes even while driving?